Excellent condition. It's a 2009 KHS Model Flite 220 Blue, thin black seat. 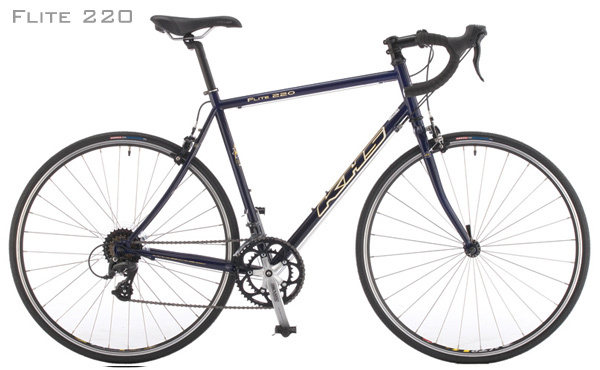 The image above is the exact bike. The male thief took the bike from our son outside an opened retail establishment: Target. The bike was last seen outside of the Target in Uptown on the north side of the building. It was stolen at 5:51 p.m. on 1/16/2014 (recorded here as 6:00 pm, your system will not allow the actual time). The thief watched him go into Target then took the bike. Together with Target’s Assets Protection Specialist, we have seen the man on tape in camera footage captured by the outdoor Target cameras. The video is preserved for the detective to follow-up with Target and retrieve the recording. The thief was wearing a black North Face-like jacket and wearing a black skull cap. The bike had a white helmet attached to it. It was also stolen. We are not sure of the brand; however, it's believed to be: Airius. There are two, orange, highly visible reflectors on the front accenting each side of the head. On February 5, 2014, the CSBR received the following email from the former victim: CHICAGO STOLEN BIKE REGISTRY…YOU ROCK!!!!! Successful recovery of KHS Bike which was stolen January 16th. Thanks to EB, who lives in our neighborhood, for keeping a vigilant eye out for stolen bikes listed in our area. She boldly shared how her friend makes fun of her for always watching the stolen bike registry. She’s constantly familiarizing herself with the articles posted online about bike recovery and protection. EB was out walking her dog one night, and noticed a blue KHS men’s bike parked in a bike rack – she remembered seeing our report posted on the registry – especially noting that it was the same type of bike that she has. She said she thought to herself, “That is too nice of a bike to be out here unattended in this weather and locked with such a flimsy cable lock.” She double-checked the Chicago registry and decided to email us today; within moments, we received her correspondence and were meeting her face-to-face at the location of the bike [admin note- bike was found locked outside of World Gym, 909 W. Montrose.] We checked our records of our serial number against those etched on the bike. Two police officers, some mega wire cutters and 4 firemen later…we now have our bike in our possession, again! We are truly grateful for her care and concern! I had never heard of the Chicago Stolen Bike Registry until the bike was stolen. I begin researching what measures I could take to try and recover the bike. Thank God for this resource and the support of the Chicago bike community. EB said she lived in New York and would never have a bike there for concerns of rampant theft; however, upon moving to Chicago and learning all about the CSBR and its biking community, she now enjoys riding her bike here. Needless to say, EB is coming to our home for dinner! Thanks all!